Bosch AQT 37-13 Plus home and car washer is durable and has a rugged construction that makes it suitable for all round applications. Right from washing your vehicle to domestic cleaning of gates, windows, floor and pathways, it also facilitates in cleaning variety of home appliances including air conditioners. Bosch AQT 37-13 Plus home and car washer comes with a nozzle cleaning pin, inlet water filter, 6m pressure hose, 5m power cable length and patio brush. 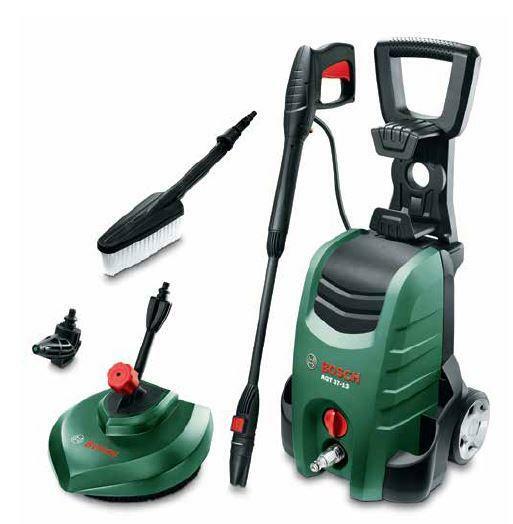 It features a 3-in-1 innovative nozzle that tackles any sort of cleaning job efficiently. This multipurpose Bosch home and car washer comes with a wide range of cleaning options and accessories for all your cleaning job. 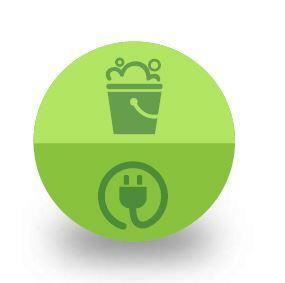 The auto-stop function enables in saving energy. It is user friendly and has an integrated accessories holder and easy-to-connect fittings. Bosch high pressure car washer has a maximum pressure of 130Bar. It has 1700W motor capacity and a flow rate of 370 litres per hour. This equipment can operate at a maximum temperature of 40 degree centigrade. It offers several functions including detergent dosing system, high-pressure gun, different spray modes, static wash brush and more. Measured values for noise determined according to 2000/14/EC. The A-rated noise level of the power tool is typically as follows: Sound pressure level 77 dB(A); Sound power level 90 dB(A). Uncertainty K= 1 dB. How is it Environment Friendly? Washing cars and domestic cleaning tasks consume plenty of water every time and solution to avoid wasting water is important for the environment. The AQT 37-13+ high pressure car washer has been designed to consume not only less water but also less electricity with an auto-stop system where it consumes only half a bucket of water as compared to cleaning manually. Cleaning your family car after a long drive or removing heavy dirt from your motorbike and cleaning your BBQs after a get together are tiring task. 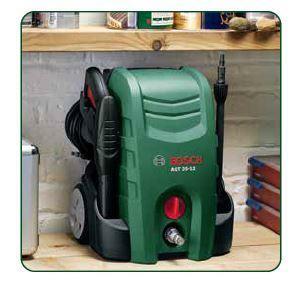 With its unique construction, Bosch AQT 37-13+ home and car washer is durable and suitable for multiple applications. Right from washing your vehicles to domestic cleaning such as gates, windows, floor and driveways it also facilitates in cleaning various home appliances including air conditioners. Its high efficiency pump with 1700W, pressure of 130 bar and water flow rate of 370 l/h, AQT 37-13+ high pressure washer provides great cleaning experience. AQT 37-13+ high pressure washer is compact and sturdy with quiet running rubber tire wheels for easy mobility and also a fold down handle integrated to pull the washer. This high pressure washer has a brilliant space-saving design in which all the accessories can be attached to the washer itself and allows the user to carry it effortlessly. 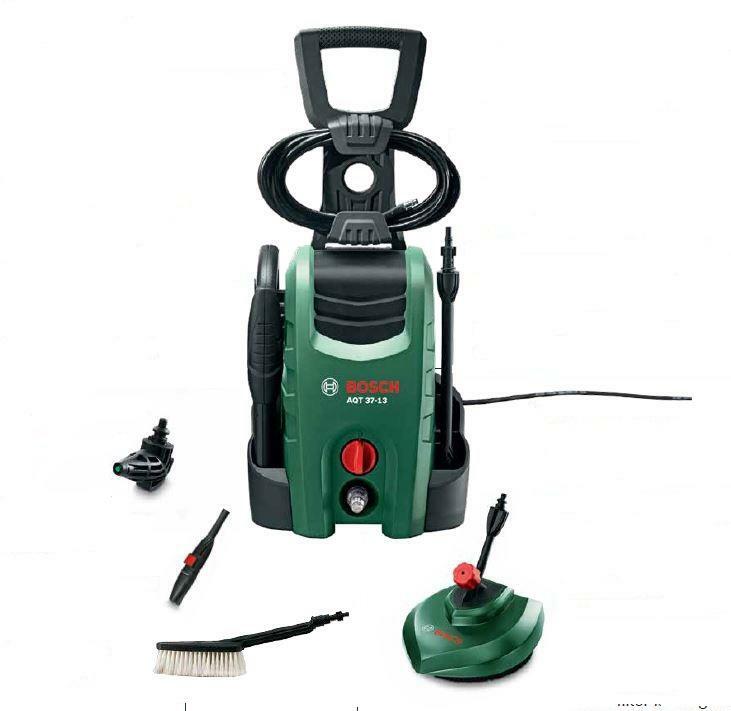 AQT 37-13+ ensures quick cleaning as it is easy to assemble and use. It takes approximately 5 and 10 minutes to wash a two wheeler and a four-wheeler respectively on a regular day which is less than half the time consumed by cleaning manually. AQT 37-13+ high pressure washer is a good all round washer equipment great for being wheeled out every weekend, it has enough power to do most outdoor cleaning tasks and is a perfect choice if you own a car. Foldable Handle: Fold down handle enables easy movement of the equipment. High Pressure Hose: This 6m hose connects the washer and pressure gun. When the trigger is on, water flows into the lance for cleaning. Bosch Gun: The red button with which we can lock the trigger that controls the whole mechanism such as the flow of water, change of modes, etc. Lance: It is the extension of high pressure gun that helps the user to clean without moving the Washer every then and now. 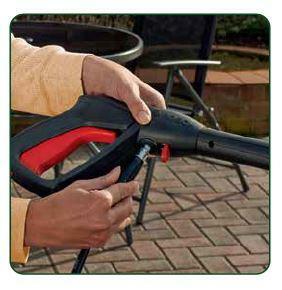 90° Nozzle: This specially designed nozzle enables cleaning dirt from hard to reach areas, for e.g. mudguard, sunshade and roof of the cars. Soap Dispenser Pipe: The soap dispenser pipe is inserted behind the washer. 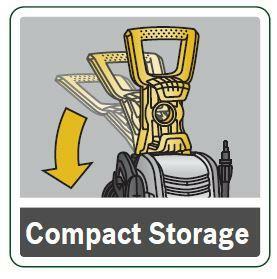 The user can simply pull it out and place it in the container with the detergent. Power Cable: A 6m power cable connects this equipment with the power supply system. 3-in-1 Nozzle: Three different modes, i.e. rotary, fan-jet and a low pressure detergent intake are integrated in this nozzle. Patio Cleaner: Deluxe patio cleaner integrated to this package which is used to clean patios, washroom tiles, car porch etc. Wash Brush: This accessory enables cleaning of car and window panes. Water Filter: A built in transparent water filter is integrated to this high pressure washer. AQT 37-13+ high pressure washer can perform all the application that are performed by AQT 33-11, AQT 33-11 Car washer set, AQT 35-12, AQT 35-12+ and AQT 37-13.